Remastered version of Gary Moore's first solo album post Thin Lizzy. 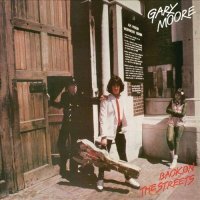 Gary Moore's first solo album post Thin Lizzy has been remastered and comprises the original tracks plus b-sides and associated single releases. Sanctioned by Moore's estate, the album in hindsight demonstrates the musical crossroads he was at in 1978 and so many points of the rock compass are covered. Firstly, Moore's post-Lizzy pedigree plus an obvious nod to the punk rock scene at the time are represented by the title track and 'Fanatical Fascists'. In these tracks, which appear early on and really set the wrong impression for the rest of the album, Moore's voice is at its most raucous and much less refined than his latter "blues" period. A further nod to Thin Lizzy is contained in the second track which is a near ballad version of the classic 'Don't Believe A Word' which kicks into the original tempo only in the outro. Phil Lynott sings this and of course the hit 'Parisienne Walkways' which incredibly got to #8 in the UK in 1979 (imagine a rock guitar near-instrumental charting nowadays?). The next genre contained in the album is the jazz rock instrumental. With a very prominent Don Airey present in the mix, tracks such as 'Hurricane' and 'What Would You Rather Bee Or A Wasp' are full of technical prowess shown off to the max. The classical / pop mix is probably the most successfully explored area with the aforementioned 'Parisienne Walkways', the ballad 'Song For Donna' and the impressive non-album single 'Spanish Guitar' which is a 6/8 acoustic ballad with a choice of vocal versions from Moore and Lynott. The b-side instrumental version of the track is also included for completeness. Most fans of Moore and/or the Thin Lizzy family tree will have the original album already but the inclusion of three versions of 'Spanish Guitar' and a remastered and repackaged CD with extensive liner notes will be very tempting.